Porto-Novo (Benin) (AFP) – With his pilgrim’s staff and panama hat, Father Godfrey Nzamujo nips up and down the paths of Songhai, the organic farm he created nearly 30 years ago to fight poverty and rural migration in Africa. The small farm covered barely a hectare when it was set up in Porto Novo in 1985 but has since become a pilot project for the rest of the continent badly in need of new ideas to maximize yields. 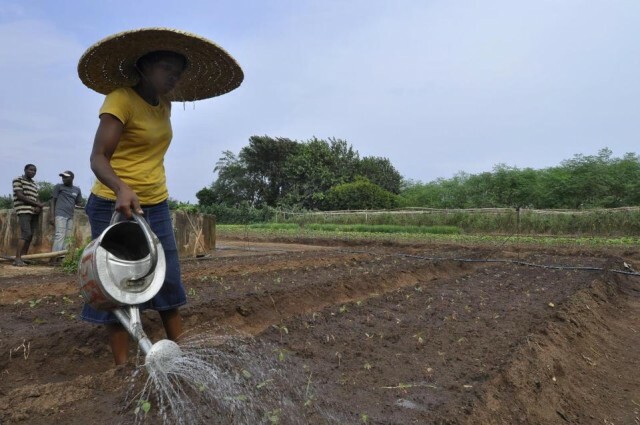 The centre in Benin’s capital now stretches over 24 hectares (60 acres) and employs an army of workers and apprentices, who toil from sunrise to sunset growing fruit, vegetables and rice, as well as rearing fish, pigs, poultry. “Nothing is wasted, everything is transformed” according to Nzamujo’s principle, with even chicken droppings turned into the bio-gas that powers the centre’s kitchens. Songhai in tiny Benin has big plans for Africa. It already has similar operations in Nigeria, Liberia and Sierra Leone and wants to set up shop in 13 more west and central African countries. Nzamujo’s raison d’etre is how to help Africans increase yields through simple techniques, without using pesticides or fertilisers, and while cutting production costs and protecting the environment. The Nigeria-born priest, who was raised in California on the US west coast, said he was shocked by the appalling images of famine in Africa on television at the start of the 1980s. He then left to discover the continent to see how he could put to good use his university training in agronomics, economics and information technology and fight against poverty on his own terms. After visiting a number of countries, he ended up in Benin where the country’s then-Marxist government gave him a small plot. “It was abandoned land, killed by chemical fertiliser and conventional agricultural practices. It didn’t work,” he told AFP. “There were seven of us. We dug wells and watered with our own hands. And during the main dry season, this grey surface became green,” he recalled with a smile. Nzamujo’s secret is in imitating nature, encouraging “good bacteria” present in the soil to maximise production without having to rely on chemicals. Yields at Songhai speak for themselves: the farm produces seven tonnes of rice per hectare three times a year, up from one tonne per hectare once a year at the beginning of the project. “Songhai is facing up to the triple challenge of Africa today: poverty, environment and youth employment,” said Nzamujo proudly. The cleric’s system centres on local production and distribution, creating economic activity to tackle poverty head on. At Songhai, jam simmers in large pots while chickens are roasted and soya oil, rice and fruit juice are packaged for sale in the centre’s shop or served at its restaurant. Discarded parts of agricultural machinery are reused to create ingenious contraptions and used water is filtered using water hyacinths. The centre also has an Internet point and even a bank so that local people can avoid going into the city centre. Youth employment is encouraged and some 400 farm apprentices — selected by competition — are trained every year. The 18-month course is entirely free. Read the full story via Organic farm in Benin looks to set example for Africa – Yahoo News.